This article was originally published by Charles Scicolone on Charles Scicolone On Wine. This article was originally published by Charles Scicolone at Charles Scicolone on Wine. I have always enjoyed Port wine in its different forms as well as Madeira but until recently, I have not had the opportunity to drink them. Michele and I decided to go to Lisbon and I was looking forward to enjoying Port and Madeira there, but by coincidence, just before we left I attended a friend’s birthday dinner were they were served Then a few days after we returned, the Wine Media Guild held a tasting of Portuguese wine. D’ Oliveira Reserva Verdelho 1966 Madeira The grapes are harvested, crushed, pressed and then fermented in stainless steel or oak. With the Verdelho grapes the skins are removed to produce this dryer style of Madeira. The winemaking process involves heating the wine. Fermentation is stopped with brandy and the time of adding the brandy depends on the grape variety. Verdelho gets the brandy on the fourth day of fermentation. The wine is put into large wooden casks which stand in a heated room. The cellar master tries to keep the characteristic taste of the shipper when blending different wines together. The age given on the label indicates the youngest wine in the blend. Blended wine with the name of the grape on the label must contain at least 85% of this grape. The other 15% can be other varieties, usually Tinta Negra Mole. Vintage Port 1963 Graham Declared by all major Port houses, 1963 was a monumental vintage against which others are now judged. This is a classic vintage port, which will still last for a number of years. Niepoort Vintage 1978 Vintage Port This was not a generally declared vintage but it was a year in which many Single Quinta Vintage Ports were produced. This was a great way to end a meal as the finish and aftertaste of the Port went on and on. Quinta do Noval unfiltered single vineyard port 2012. Made exactly like a Vintage Port with only noble grapes from the Quinta. The grapes are crushed by foot and the wine is unfiltered. It is aged in casks for 4 or 5 years instead of the 2-year aging for Classic Vintage Port. The wine has nice flavors and aromas of black fruit and a touch of prune. It can be drunk now but will improve with age. Dalav Colheita Port 1985 Port from a single year harvest. Instead of an indicator of age like blended tawny (10,20,30, 40…) the year is always on the label. It should not be mistaken for a Vintage Port because the Colheita must age for a minimum of seven years in oak casks. This is an elegant wine with a lot of aroma and flavor of dry fruit, spice, honey, nuts, cinnamon and a very pleasing finish and aftertaste. I really liked this wine and a brought back a few bottles. The wine does not develop significantly in the bottle. Kopke 20 years Old Tawny Port matured in wood. Grapes are hand picked, destemmed and crushed and made into wine by a careful maceration to extract the color, tannins and aromas, enhanced by constant churning during fermentation. Fermentation takes place in vats (lagares) at a controlled temperature (29 to 30 C )until the right degree of sweetness (balumè) is achieved. Grape brandy is added to create the final fortified wine made by blending different vintage to achieve the typical characteristics of aged Tawny Port. The wine is then matured in casks. Valriz Porto 20 years old Tawny Port made from Tinta Amarela, Tinta Roriz and Tounga Franca. Aged in large chestnut casks. The wine has hints dried fruits, almonds, hazelnuts and spice. We had the 10 year old and the 20 year old side by side. The 20 year old was well worth the extra money. Quinta do Vallado 20 year Old Tawny This is a fortified wine made mainly from Touriga National, Touriga Franca and Tinto Cä from old vines plus 5 other indigenous grapes. The grapes are handpicked from the estate vineyards. Because port wines are intended to be sweet, fermentation is arrested half way through the process, before all the residual sugar has been fermented. Fermentation is halted through the addition of grape spirits, thus producing a fortified wine. The wine is aged in 600-liter old oak casks and other oak vats for years during which time the complex aromas and flavors can develop. It is a rich, nutty wine with aromas of dried fruit and a touch of smoke. The alcohol is 20%. C.N. Kopke Porto Colheita 2007 (White Port) Fermentation takes place in stainless steel vats where the grapes macerate and are churned with their skins on at temperature between 16 to 18 C. This produces a wine with color and structure that can sustain a prolonged aging in oak. The fermentation is halted by adding grape brand and thus creating a fortified wine. A Colheita wine matures in oak barrels for a period of time that can vary but never less than 7 years. It is bottled and sold according to the demands of the market. The wood aging is a perfect combination with the stone yellow fruit and the hints of citrus. There is mingling of the acidity and sweetness, which gives the wine an elegant and delicate finish. This was the first time I had a white Colheita Port and I will drink more. Taylor Fladgate Quinta de Vargellas 1986 Single- quinta (single vineyard) vintage port is produced only in exceptional years in which a general vintage is not declared. Quinta de Vargellas has the highest percentage of old vines of any quinta in the Duro, with 60% over 75 years old. All of the grapes undergo the traditional foot treading method. Fermentation is halted by the addition of grape spirits before all the sugar has been fermented producing a sweet fortified wine. The wine is aged for two years in wood and then bottled unfiltered and will continue to age in the bottle for years. This is a wine with black fruit aromas and flavors and a hint of prune. 1986 was not a generally declared vintage. 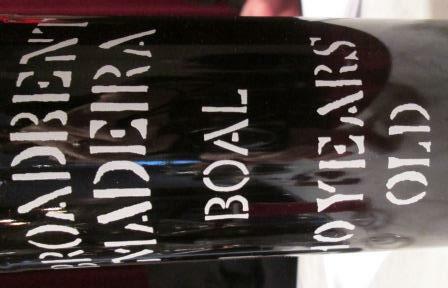 Broadbent Boal Madeira 10 year old made from a white grape. The alcohol is 19%. This wine is about $30 and it was so smooth and velvet-like that it was almost too much! “You just haven’t met the right one.” That’s what I used to tell myself every time I tried a white port. I was eager, willing, and always disappointed. Until I tasted a Kopke White Colheita 2007. Boy, what a revelation. I had become habituated to bland, characterless white ports, the kind routinely served to the thousands of tourists who flock to the quayside port lodges in Vila Nova da Gaia, across the river from Porto, Portugal. Instead, Kopke’s amber-hued version is layered and seductive, an aromatic bundle of brown sugar, crème brulee, hazelnut, and lemon peel, with just the right balance of sweetness and acidic lift. Nothing cloying here. Nor is this a white port you’d ever want to mix with tonic water, the way the Brits do with lesser versions. 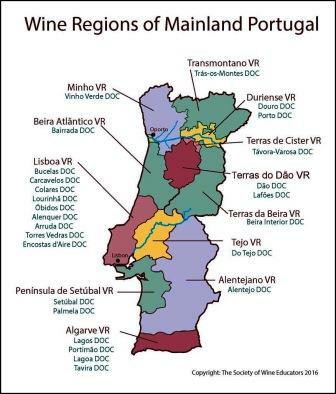 Funny enough, this revelation happened not in Portugal, but in New York City, at a tasting of Portuguese wine organized by food & wine writer David Ransom for the Wine Media Guild. I was happy to see some old friends there, like Quinta do Passadouro, Wine & Soul, and Quinta de Chocapalha, all linked in one way or another to the Douro power couple Sandra Tavares da Silva and Jorge Borges, superb winemakers both. I also made some new acquaintances, like the Alentejo winery Alexandre Relvas, whose amphora-aged Art.Terre Amphora Red jumped out with its unique flavor profile, an explosion of blueberry fruit. Among the handful of Ports, I fawned over Quinta do Vallado’s 20-Year Tawny—as good as it gets—and nearly fainted when I spotted the 1986 Vintage Port from Taylor Fladgate’s Quinta de Vargellas, which was aged to perfection. Kopke, established in 1638 by a German entrepreneur, is one of Port’s oldest firms. It’s known for its tawnies and colheitas (with stocks going back to 1938). And it’s always such a treat to visit their tasting room in Vila Nova da Gaia, where you can sample a deep library of older vintages by the glass. So I shouldn’t have been surprised that they also work their wood-aging magic on white port. Most white ports sit in cement or stainless steel vats for 18 months before release. Instead Kopke’s white colheita stays seven years in wood, just like a tawny colheita. Inside the barrel it takes on a nutty, oxidized character that give it a kinship to tawnies, but with a base of white grapes rather than red. According to Richard Mayson’s Port and the Douro—essential reading for any Port lover—there aren’t too many firms that bother to make a wood-aged white port, in part because most believe the Douro’s native white grapes don’t have as much personality as the reds. 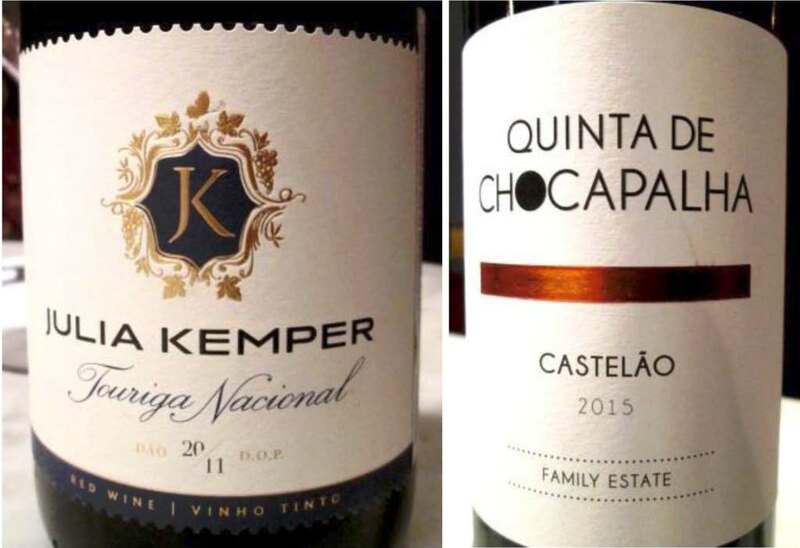 In addition to Kopke, the echelon who make this rare category include Churchill’s (aging it 10 years in barrel), Niepoort (also 10 years), Quinta de la Rosa (2–3 years), and C. da Silva, a firm known for its coheitas, offering a family of age-designated white ports ranging from 7 years to 40 years in oak. Bottom line: I have yet another good incentive to return to the Douro. But you can find the Kopke 2007 stateside as well. It retails for about $65 and is distributed by Wine in Motion [contact customer.service@wineinmotionusa.com; their new website will be live in January]. What a great presentation of fabulous vintages of Bordeaux wine. You will see in the picture the four representatives from the very top estates in Bordeaux who came to New York to showcase several of their vintages. It was an amazing event as you can imagine. In the picture to the extreme right, let’s start with the only table with both dry white wine and red wine represented by Wilfrid Groizard (wearing a black sports jacket, who is the commercial and marketing director of Chateau LaTour-Martillac in Graves. M. Groizard brought three FABULOUS white wines, the 2011, 2013, and 2015 vintages. Of course he had me at the 2011, a great blend of Sauvignon Blanc and Semillon. I will write more about the new Semillion massal selection in another article. And it goes without saying that the reds of Chateau LaTour-Martillac are also fabulous. We had the precious 2000, 2010 and 2015 vintages and I will not reveal my favorite. Oh yes, one of the most interesting tidbits of the visit was his showcasing this tasting diary of the original owner from the 1930s — one of the drawings became the label still used on the wine today. Wearing a black suit in the photo is M. Phillippe Blanc, Managing Director of Chateau Beychevelle. I have known M. Blanc for a few years now and have stayed at the fabulous chateau which is now open to guests (more later in another article). M. Blanc brought several vintages including 2000 (oh yes! ), 2005 (more, please) 2009, 2014, 2015 (all excellent) and also the new second wine Admiral de Beychevelle 2015. What is interesting about the estate is the ever shifting percentage of Merlot, which in some vintages is just a small amount less that the Cabernet Sauvignon. I will investigate this trend further and report back. The fashionable and charming woman is Sophie Schyler Theirry, family owner and Development Director of Chateau Kirwan. Just a few weeks back I was lucky enough to attend the opening dinner for the En Primeur evening for journalists in their new Chai. Madame brought several vintages including the memorable 2000, 2008, fabulous 2009 and 2010, and the highly rated 2015. What was super interesting at the Chateau was the new “tulip shaped” fermentation vessel – more on that later! Wearing tan slacks and a sports jacket is Didier Galhaud, export manager of Chateau Guiraud. M. Galhaud brought several vintages, all so incredibly great …. I am a huge supporter of enjoying Sauternes at the beginning of the meal as an aperitif instead of waiting until the end. I wrote extensively about this for the World of Fine Wine a few years back. My favorite of his offerings today was the 1998 of course, then the 2009, 2010, and 2015. And here is an interesting thing. He also brought the Petit Guiraud 2015, which is made from younger vines with less oak and sugar. A great afternoon of Bordeaux here in Manhattan, with special thanks to the WMG organizers and the producers who showed their wines so beautifully. It’s said about California wines that the only reason to know the vintage date of a bottle is to figure out who made the wine at a particular winery, since the California weather is more stable than the position of winemaker, who are often “drafted and signed” by facilities like prized sports figures. Whether that’s fact or merely witticism, the situation with the quality and quantity of wine from a particular vintage in France, particularly in Burgundy, is certainly more dependent on the vagaries of the year-to-year changes in weather, with the same winemaker at the same facility for long periods of time. With that in mind, the Wine Media Guild (a New York-based organization of professional wine communicators) sought to determine the quality of the 2015 vintage of Burgundy with a luncheon tasting at Manhattan’s Il Gattopardo of 14 whites and an equal number of reds from a widespread range of Burgundian locales. Overall, the consensus was that this was an excellent year for Burgundian wines, with the whites ready to drink now or in the next few years, since the climactic conditions generally produced ripe, full-flavored Chardonnay grapes with less acidity than found in a number of other recent harvests. On the other hand, these same weather conditions also allowed the Pinot Noir to ripen fully, yielding red wines best to consume a few years from now and expected to be quite long-lasting. Unfortunately, these days most good Burgundies are not geared to the faint of wallet, so in order to guide consumers about purchasing these wines, the following are my notes on what I considered the top ten bottles presented.WhitesChâteau Fuissé Pouilly-Fuissé “Les Clos” Propriatire Récolant ($64)—Made from Chardonnay grapes grown on a vineyard with vines dating to 1929, this wine had a bouquet and rich taste of apples and honey with notes of almonds and hints of apricots and orange in its long finish. It’s an ideal white to mate with risotto or roasted chicken. Bouchard Père & Fils Chevalier Montrachet 1er Cru ‘La Cabotte’ ($560)—While a bit much for most pocketbooks, this memorable wine is aesthetically a cut or two above many of the 2015 white Burgundies. It has a distinctive bouquet and taste of pears with hints of marzipan and a touch of lime in its vibrant finish. Expect it to drink well with the likes of lobster, scallops, or tuna tartare for the next 5-10 years. William Fèvre Chablis Grand Cru Bougros “Côte Bouguerots” ($98)—This full-bodied wine, with a bouquet and taste of peaches and citrus, has a crisp, fruity finish perfect to pair with seafare, especially grilled dorade or branzino. Maison Joseph Drouhin, Chassagne Montrachet, 1er Cru “Les Embazées ($90)—Grapes for this wine hailed from vineyards noted for a complex soil of limestone and clay. Following harvest this wine was fermented using natural yeast and aged for 12 months in French oak barrels. It has a bouquet and taste of apples with undertones of honeysuckle and hazelnuts and should drink well over the next 10 years with ripe cheeses and grilled seafare, particularly swordfish or tuna. Domaine Laroche 1er Cru Les Vaillons Vielles Vignes Chablis ($41)—Very well priced for a Premier Cru Chablis, this wine is made from grapes grown in a vineyard composed of fossilized oyster shells. It shows a bouquet and taste of apples and peaches with notes of apricots and zesty lemon in its finish. Unlike many 2015 Chablis, this wine contains enough acidity to age well and pairs perfectly with bivalves or shellfish. Bouchard Père & Fils Nuits-St-George 1er Cru ‘Les Cailles’ ($108)—This wine shows a fragrant bouquet and taste of ripe berries, with hints of oak and earthy spices. And, while lighter in taste than many other Nuit-St-George reds, it harmoniously matches with lamb or veal and is expected to gain complexity with a few years of bottle age. Domaine de Bellene, Beaune 1er Cru Cuvée Cinquantenaire ($90)—This blend of grapes from five different premier cru Beaune vineyards shows a bouquet and taste of plums with notes of ripe cherries and toasty oak. A bit young to drink now (although it marries well with grilled lamb or beef), expect this wine to become more complex and elegant with 5-10 years of bottle age. Louis Latour Gevrey-Chambertin ($80)—Made from hand-picked Pinot Noir grown on 30-year-old vines in vineyards noted for chalk and limestone soil, this wine was aged for a year in oak barrels following fermentation. It has a distinct bouquet and taste of black currants with notes of anise and a smooth finish that mates well with grilled chicken or ripe cheeses. Vincent Giradin, Santenay, Terre d’Enfance ($34)—A good bargain, this hand-harvested Pinot Noir grown in limestone-rich soil has a bouquet and taste of fresh strawberries and plums with hints of almonds in its smooth finish. It makes a good wine to match with summertime barbecue, especially grilled ribs, chicken or hamburgers. Domaine Antonin Guyon, Savigny-Les-Beaunes ‘Les Goudelettes’ ($40)—This well-priced wine was made from hand-harvested Pinot Noir fermented over 15 days in open vats and aged in oak barrels (15% new) over 15 months. 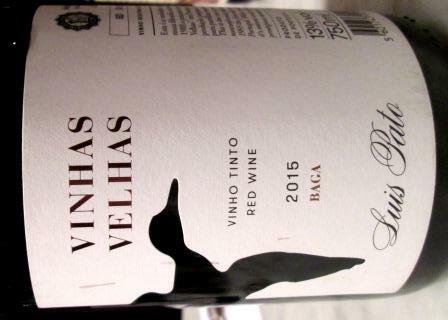 It shows a fruity bouquet and taste of ripe plums and blueberries with a long, smooth finish that matches well with duck or grilled pork.